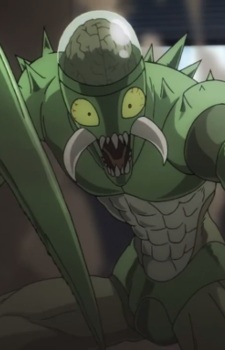 Kamakyuri was an artificial mutant created by Dr. Genus. He is an advanced form of praying mantis, and purported to be among the stronger specimens of the House of Evolution. Appearance: Kamakyuri is a tall humanoid creature with many insect-like qualities. He is encased in a segmented, thorny exoskeleton, with clawed feet and serrated, scythe-like forelegs, similar to those of a praying mantis. Mandibles protrude on each side of his mouth, and the top of his skull is transparent and reflective, revealing his brain. Personality: Nothing is known of Kamakyuri's personality due to his defeat by Saitama.